Ho ho ho, and welcome to a very merry edition of Mini of the Week! Today, on Christmas itself, many of you may be enjoying time with your family, but let's not forget who brought all of those presents under the tree. I'm talking about Santa Ogre of course! What, you didn't get a half squished Gnoblar and a partially eaten chunk of unidentifiable meat? Just me? Oh well. 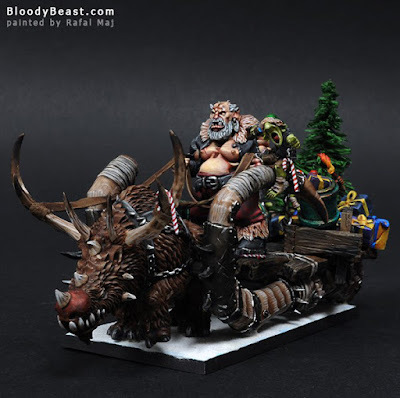 There are plenty of Santa Clause themed Warhammer models out there. In fact, I shared a few of them in Wednesday's post. I find this one particularly effective though due to how involved the conversion is. A lot of what we see is just putting a Santa hat and a beard on X mini and calling it good. Not for this hobbyist though. They went through and converted up an entire sleigh of Ogrey Christmas goodness. It's seriously impressive. I have to imagine this took quite a bit of planning before any of the actual modeling took place. I really like the Gnoblar elves hanging around the back of the sled. It adds a tone of character to the piece and makes it feel more "real." 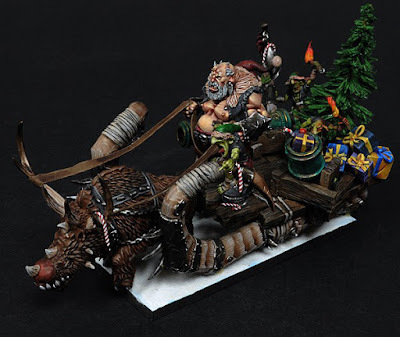 I can imagine this jolly fellow driving his sleigh around the mountains of Mourn delivering gifts to all of the Ogres in town. I really like the conversion on the Ogre himself too. He looks like what I imagine Billy Bob Thorton's Bad Santa would look like as an Ogre. The conversion work done for the head would look great on a non holiday themed model as well. The scraggliness of the beard lends itself to the Ogres and gives us a nice break from all of the fu manchu mustaches. The paint job on this is pretty good as well. It's nice to see a Christmas themed model like this be taken as seriously as a regular mini would. I really hope they use this in game, perhaps as Greasus Goldtooth?